Concerto for Two, for two harpsichords (15 minutes). 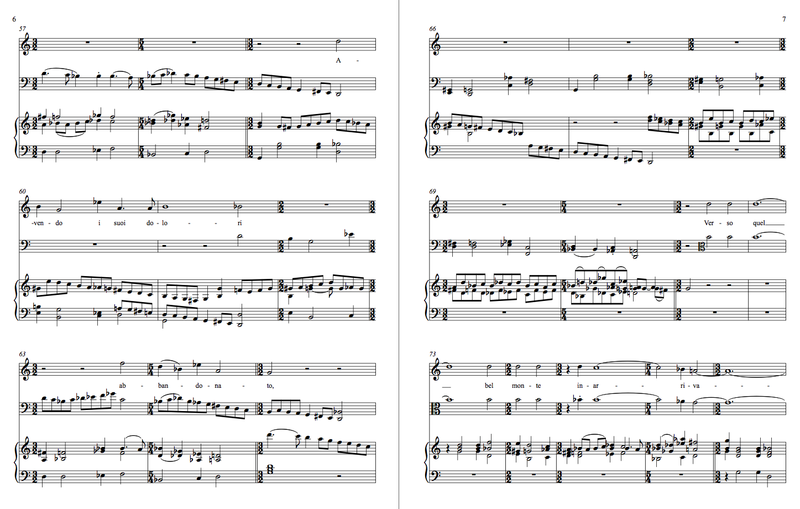 Commissioned by the Aliénor Foundation, premiered by Elaine Funaro and Rebecca Pechefsky at the Historical Keyboard Society of North America International Conference, Montréal, May 2015. Performance Video by Erik Ryding 2016. Six Harpsichord Miniatures (10 minutes). 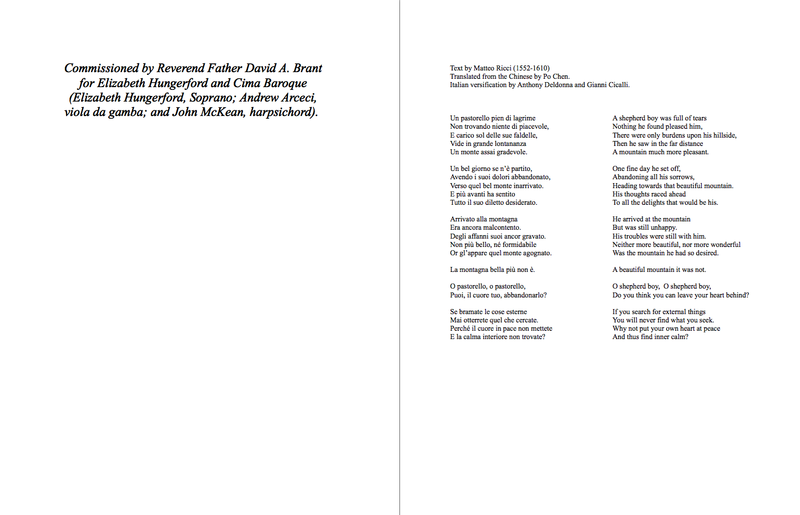 (Winner of the 2012 Aliénor Foundation Composition Competition.) 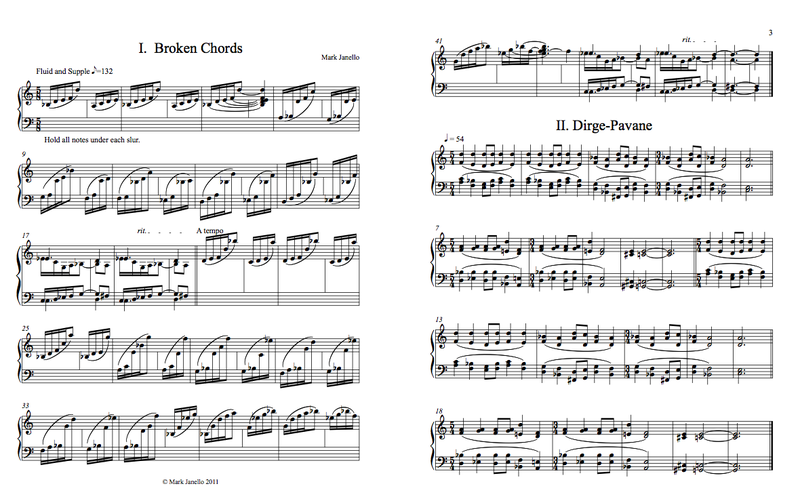 Score samples: Movement 1, 2, Movement 6. 2. Youtube video of a live performance by harpsichordist Rebecca Pechefsky. 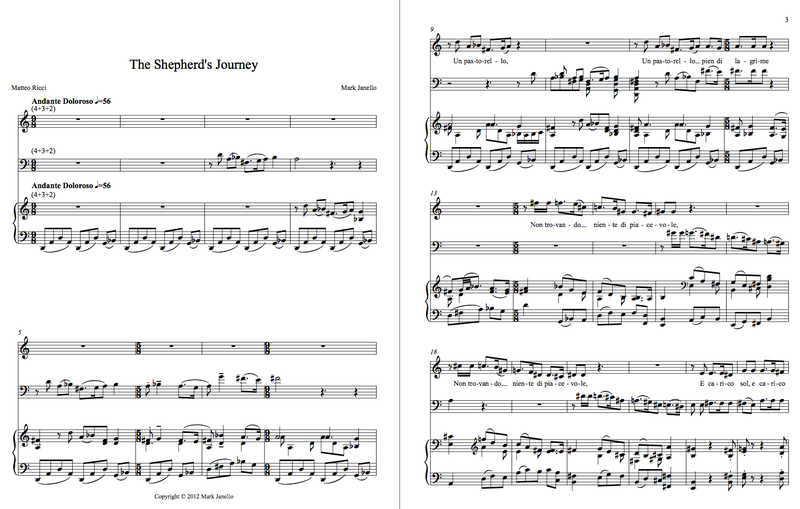 The Shepherd’s Journey, for soprano, viola da gamba, and harpsichord (8 minutes). Text by Matteo Ricci (?-1610). Score sample 1 2 3 4. Sound sample here. 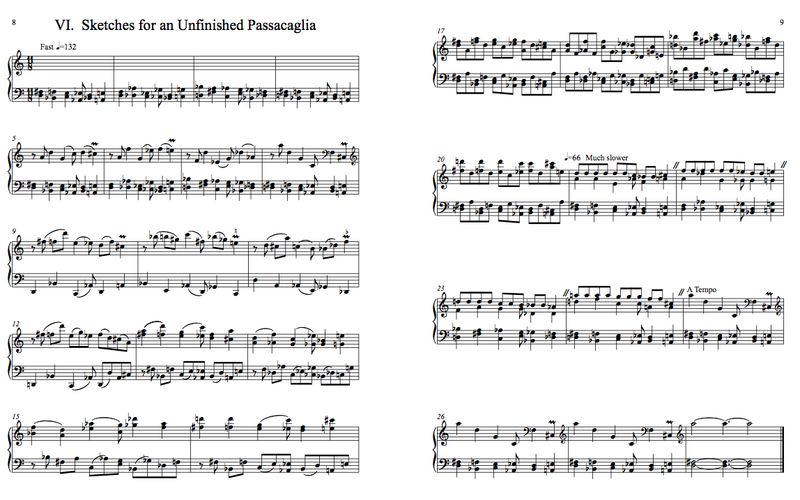 Prelude for solo viola da gamba (6 minutes). Imaginary Voyage II for 4 flutes (8 minutes). Score sample here. Sound sample (MIDI realization) here. Imaginary Voyage I for Saxophone Quartet (8 minutes). Score sample here. Sound sample (MIDI realization) here. certain dreams uncertain (15 minutes) for solo marimba (5-octave). Score sample here. Sound sample here. Sonata for Flute and Marimba (12 minutes). Score sample here. Sound sample here. Suite for solo Piano (12 minutes). Score sample here. Sound sample here. The Art of Prelude and Fugue IV: Lura Johnson, Piano, presents the complete Well-Tempered Clavier of Bach and the complete Preludes and Fugues of Shostakovich. Final concert 20 May, 2019 (Panel discussion 6.30, concert 7.30; Griswold Hall, Peabody Conservatory.) Panelists Maestra Marin Alsop, Tom Hall (WYPR), Professor Mark Janello (Peabody Conservatory), Joseph Horowitz (Executive Director, PostClassical Ensemble); moderated by Fred Bronstein (Dean, Peabody Conservatory). Further information. Upcoming concerts: Catholic University Devotional Music of the Baroque series. February 22; March 22. 1pm in the St. Vincent de Paul Chapel. 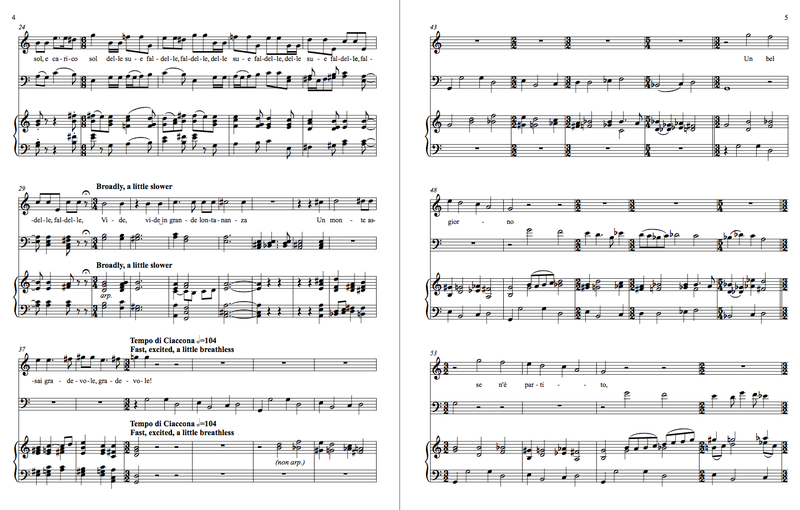 Recent Premiere: “Prelude and Counterpoint No. 1, in C” for solo harpsichord, performed by Elaine Funaro, at the Historical Keyboard Society of North America Annual Meeting, Ann Arbor, MI, 12 May, 2018. “Quartet for Harpsichord and String Trio” — Premiered 4 February 2018, Durham, NC, by the Mallarmé Chamber Players. Recital: Improvisation on Clavichord, Harpsichord, and Organ. Historical Keyboard Society of North America 5th Annual Meeting, Oberlin Conservatory, March 20-23, 2016. (Tuesday, 3/22, 10.30am (tentative)). Counterpoint Blog Musing on contrapuntal oddities. Useful information and files for my students.